Retired Detective Bill Hodges now runs a two-person firm called Finders Keepers with his partner Holly Gibney. They met in the wake of the Mercedes Massacre, when a queue of people was run down by the diabolical killer Brady Hartsfield. The adjustment has been damned difficult, but in the seven years since the incident, Martine has come to terms with her limited mobility. She and her mother, who stepped up to the plate in the wake of that darkest of dates, have grown closer than ever before. They've been, by all accounts, happy—hard as that might for some outsiders to imagine—and happy people don't force overdoses on their dearly beloved daughters then takes cannisters of gas into the bath, do they? Because of Hodges' history with Hartsfield, he and his recalcitrant partner Holly Gibney are, as a courtesy, invited to see the scene of what the police are keen to call a murder-suicide, and although the evidence in support of that theory is clear, when our PIs find a Zappit—a budget-brand tablet Hodges has seen the object of his obsession play with in the past—they can't help but suspect a connection. But how could Mr Mercedes be involved in the deaths of Martine Stover and Janice Ellerton when he's basically brain-dead himself? And perhaps there's some truth to that—some truth and even a touch of justice to our det-ret's desire to ensure that Hartsfield, having done the crime, does the time. But remember, readers, the last scene of Finders Keepers: a break in the straight story King had told to date in which Mr Mercedes seemed to express his feelings through, of all things, telekinesis. And that's kind of... it. Hartsfield has no control over his own body, so, somehow, he's started hijacking the bodies of passers-by to do his dirty work: work which involves inciting the seeming suicides of the several thousand survivors of his various attacks way back. Oddly for an author so closely associated with the supernatural, Stephen King's naturalistic narratives have been among his most magical. When for whatever reason he can't lean on the MacGuffins he so often uses to sustain his stories, he has to work that much harder to make them in some sense momentous, and this, I think, brings out the best in King as a creator—see last year's Finders Keepers, which for my money holds up against even Different Seasons. 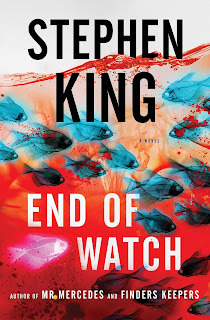 The former book's conclusion gave us fair warning where End of Watch was going to go, granted, but even so, if you're going to introduce something speculative into a world arranged around the idea that every event can be explained, you have to at least give a reason why the rules have summarily changed. 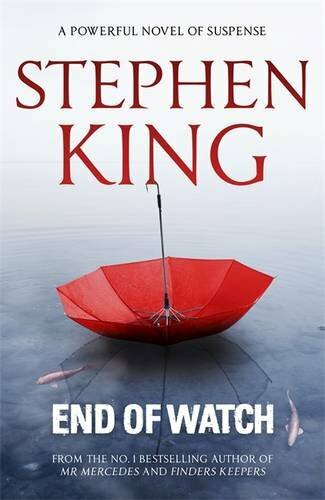 And alas, King doesn't do a great job of squaring up the supernatural elements of End of Watch with the unaffected suspense of Mr Mercedes and its superior sequel. It feels, frankly, like he simply gave in to temptation, and I'm no happier about that than I would have been if, for example, Katniss Everdeen had suddenly developed superpowers during the last act of Catching Fire. End of Watch isn't especially welcoming to new readers either. There's a little recap here and a bit of explanation there, such that folks unfamiliar with the other Bill Hodges novels will have enough knowledge of the plot to follow along, but they'll miss out on the perversely intimate history that justifies the dynamic between between our hero and Hartsfield, and sadly, divorced as they are from their earlier development, the story's supporting characters are apt to come across as caricatures. 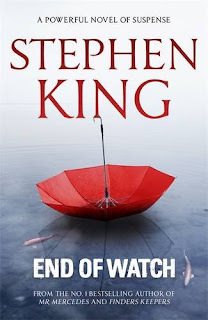 But if, like me, you're a returning reader, and you're willing, as well, to swallow the mind-control medicine, End of Watch does satisfactorily wrap up the Bill Hodges trilogy. King gets the band back together in time for at least one last hurrah—and it's a pleasure to watch them perform—before hurling all involved headlong towards an ending that had me on the edge of my seat. 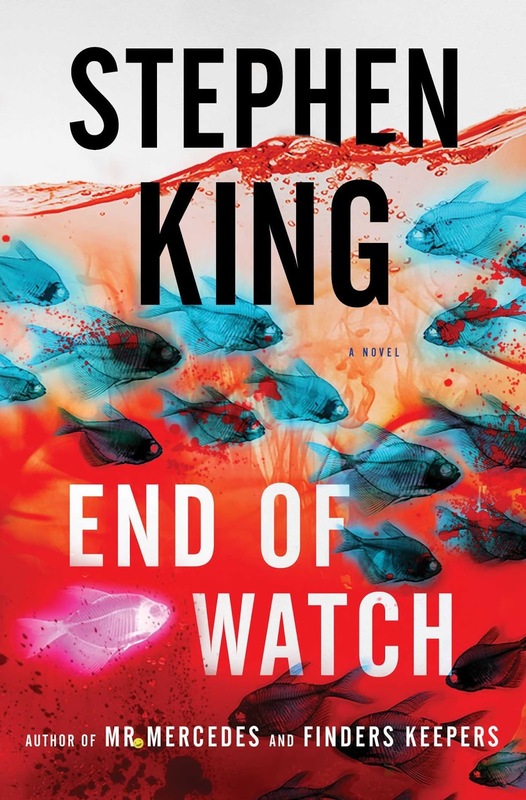 Thus, though End of Watch is the least of the three books of the series it completes, it bears repeating that its predecessors have been exceptional.